Extremely distant galaxies are usually too faint to be seen, even by the largest telescopes. But nature has a solution—gravitational lensing, predicted by Albert Einstein and observed many times by astronomers. 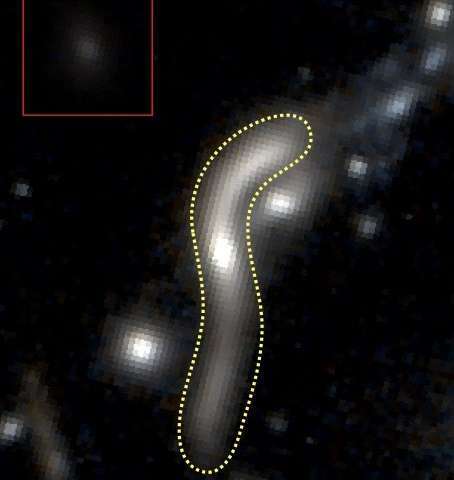 Now, an international team of astronomers led by Harald Ebeling from the University of Hawaiʻi has discovered one of the most extreme instances of magnification by gravitational lensing. Although similarly extreme magnifications have been observed before, the discovery sets a new record for the magnification of a rare "quiescent" background galaxy—one that, unlike our Milky Way, does not form new stars in giant clouds of cool gas. Follow-up observations of eMACSJ1341-QG1 are in progress, using telescopes in Chile and on Maunakea. Details of the discovery are published in the Astrophysical Journal Letters. The plasma ignoramuses just can't understand what they are looking at, so they claim lensing BS. Maybe they are observing the humongous hubris of an EU fanatic. So, please do explain what they are looking at. Failing that, point us to the work of whoever these plasma geniuses are that have described this. If you can't do either of those things, then be quiet. "When first discovered, the high redshift quasar in the nucleus of a low redshift galaxy caused a panic. To save the redshift/distance conviction, gravitational lensing had to be invoked despite Fred Hoyle's calculation that the probability of such a lensing event was less than two chances in a million! And there is little sign of the expected reddening of the quasars' light if it had passed so deeply through the dusty spiral. A change in brightness of the quasars was observed over a period of three years. Arp's explanation is that the galaxy has ejected four quasars, which are growing brighter with age as they move farther from the nucleus. The lensing explanation is that the bending of the light varies when individual stars pass in front of the quasar. If the lensing explanation were correct, the quasars should brighten briefly and then fade as the star moves out of alignment." ^^^^^Source, woo boy. GL has been proven many times. We can even use it to find distant exoplanets. It isn't a theory. It is proven. ^^^^Forget the source - I found it. Not linking, but it comes from the unqualified velilkovskian loon, Thornhill. Whoda thought? Lol. Says the dark matter lap dog.